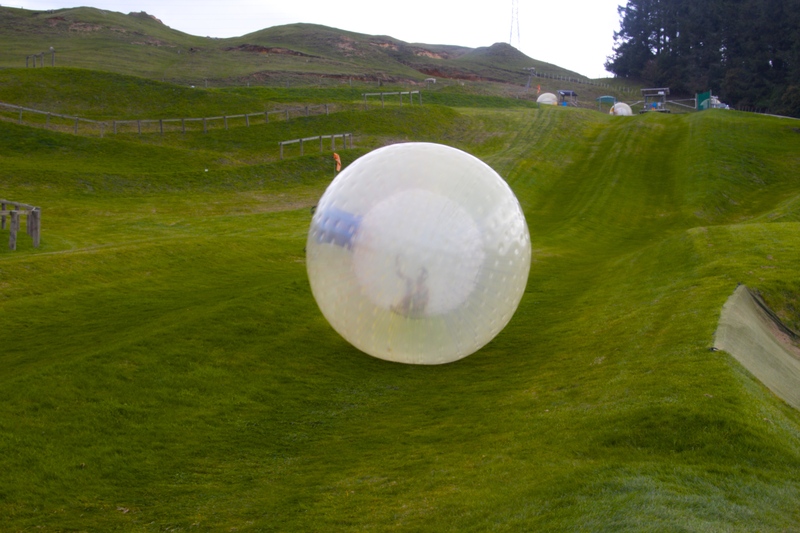 When going on my Zorb adventure, I decided I’d go straight to the source. 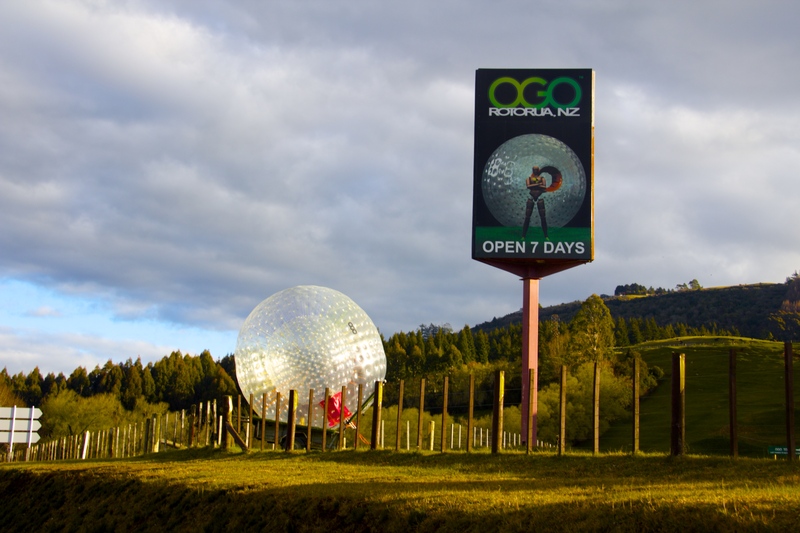 I went with a company called Ogo, whose founder was the inventor of the Zorb ball. I guess I was oversimplifying the balls by just saying they were giant plastic hamster balls; they’re actually pretty complex inventions that involve an inner and outer chamber and a lot of cushy spokes that probably are the thing that are keeping the whole contraption together. The balls are made of a thick but soft industrial-strength plastic, strong enough that it won’t puncture if it hits rocks or other small objects on the ground. The balls also ensure that the Zorber never hits the ground as they’re tumbling around, which my bum was very grateful for! The track itself is also a little more advanced than your average hill, but its still not a whole lot more than a glorified hill. 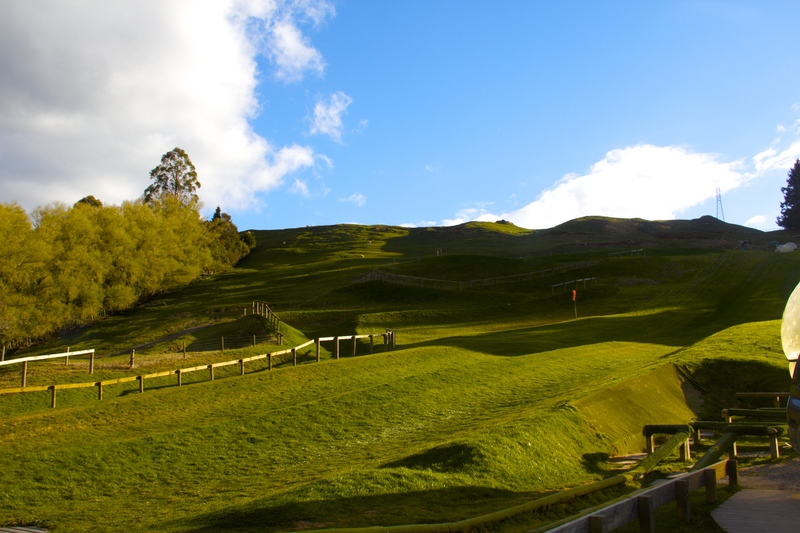 The Sidewinder track has some man-made moguls dug into it that force the Zorb ball to change directions every fifteen-ish seconds, while the straight hill just has a simple, straight track dug out, with up-raised sides to keep the ball from veering off path. After convincing my friend Marie, who was staying at Crash Palace with me, to come with, we went down to the reception of our hostel to book the trip and pick up a 10% off discount voucher. 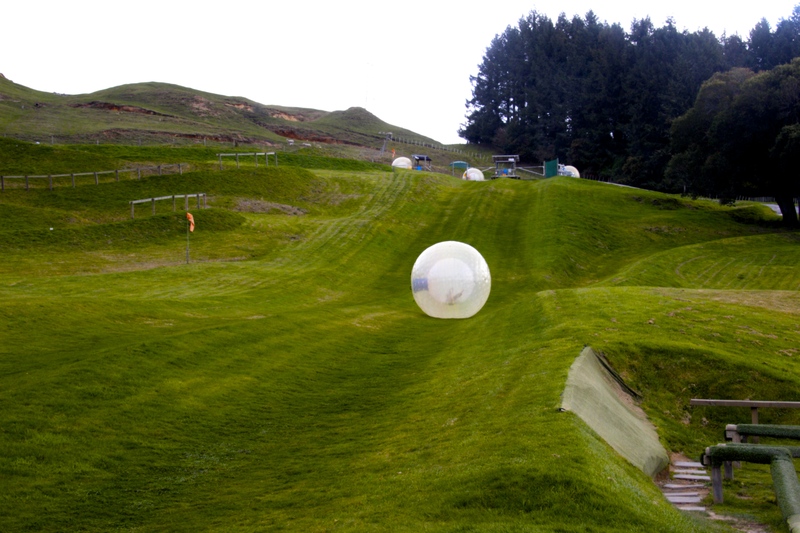 (Tip: If you’re considering going Zorbing, check with the staff at your hotel or hostel to see if they offer any discounts, as it can save you a load of money with minimal effort!). 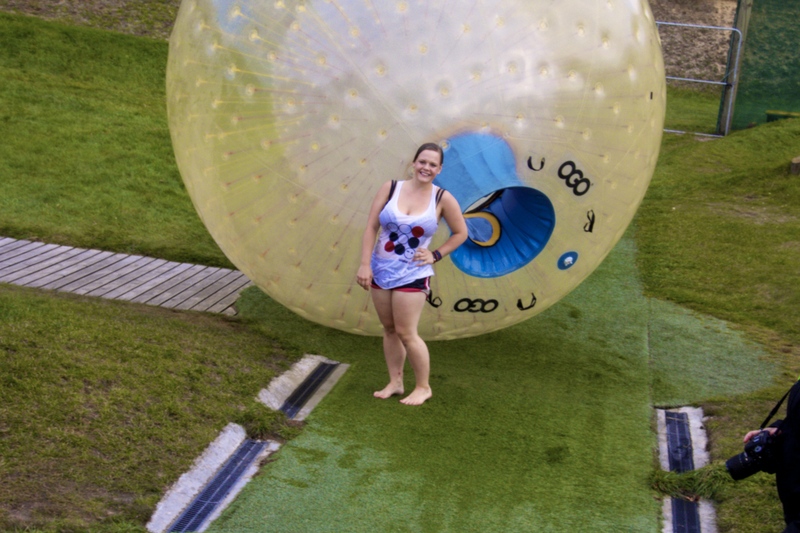 Even though we were going at the tail end New Zealand’s winter, we were slated to do the water Zorb, where the instructor fills the ball partway with water to give you a waterslide-esque ride. It was a little bit chilly out, so we made sure to wear warm clothes to the Ogo location, knowing that we’d want to be warm after our rides. We also packed a small bag to take with us, containing a t-shirt/tank top, a bathing suit, shorts, a towel and a pair of flip flops, then we were set to go! From Rotorua city center we caught the bus, and rode it for about ten or fifteen minutes before we were dropped off at Ogo. When we got to Ogo we made our way over to the little reception building, which was surrounded by some changing rooms, two full-size hot tubs, a few bean bags and a functional stove, provided for the comfort of those who were there to give moral support to the Zorbers, but didn’t want to go Zorbing themselves. We approached by a friendly member of their staff, who gave us a full introduction to the Zorbing experience and gave us some information about our options. We ended up deciding that we wanted to do two rides each, and chose a solo ride on the straight track, then a joint ride down the Sidewinder. We quickly changed into our bathing suits and spare tank top and shorts, then headed out to the platform in front of the Zorbing tracks. Marie went up first while I waited down below, equipped with my camera and my curiosity. Finally, she came down the hill and I handed off my camera to her, and she couldn’t stop talking about how awesome it was! Excited, I followed another staff member into a truck, which was thankfully coated in plastic to keep the seats from getting wet. We drove up to the top of the hill and the instructor filled the ball up with water, then told me to dive in. 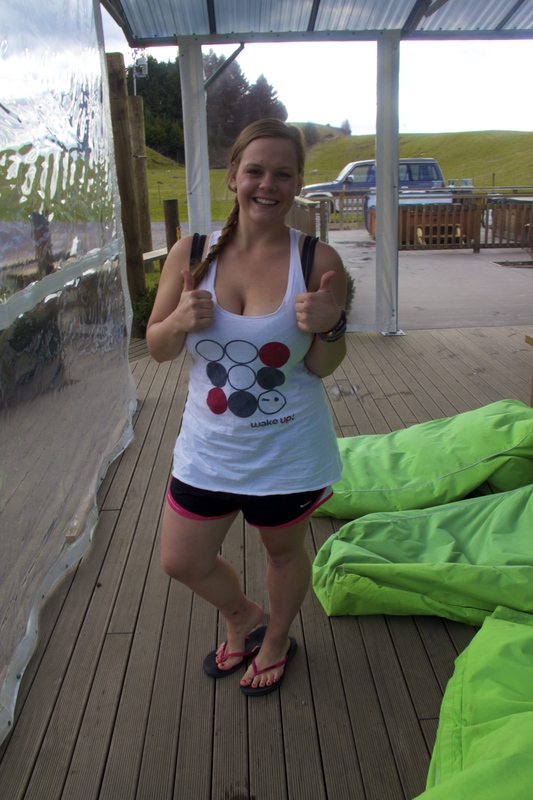 Pre-zorb and ready to go! Getting into the Zorb balls is definitely kind of an awkward experience; you literally have to dive in head first, like you would into a swimming pool, except that you’re generally dry and end up getting stuck on the damp plastic, forced to wiggle your way through like a beached whale. I imagine the Zorb instructors probably get a good laugh out of it sometimes, though mine was nice enough not to laugh outright at my awkward struggles, at least not loudly enough that I could hear him. After a little finagling I finally got into the ball and the instructor handed me my GoPro, showing me how to use it briefly before closing up the ball and rolling it onto the track. And then I was lurched into motion, spinning and slipping and sliding around, all while trying to smile and look presentable for my video. It didn’t work, and I ended up just laughing and squeaking and being an all around messy nightmare as I tumbled down the hill, video be damned. And it was so much fun! Unfortunately I don’t have the video on new new computer, but I might be able to upload it for posterity at a future date. After my first Zorb ride grinning (and posing) like its my job. When my ride was done I was rolled back toward the unloading area, then birthed my way out of the ball feet-first, plopping ungracefully on the ground with flailing legs like a baby giraffe. Marie had made that part look easy, but it definitely was not! I gathered myself up again all the same and posed for a few photos before heading back over to Marie, where we finally gushed together about how much fun it was. We took a quick break to jump in the hot tubs to warm up while the staff got busy setting up the next ride. After a few minutes we got back into the truck and were driven back up to the top of the hill, bringing the camera with to snap a few shots of the amazing view from the top of the hill before we piled awkwardly into the double Zorb ball. We repeated the GoPro process, but I let Marie hold the camera this time, as I was pretty terrible at doing it the first time, then shuffled our way onto the track. Marie and I just before our Sidewinder ride. Even though I thought the ride couldn’t get better than it had the first time, it did! It was way more fun doing it with another person, and the Sidewinder track was longer and more interesting than the first one. All in all we went for about a minute and a half, getting thrown around and laughing together the whole time. Thankfully we didn’t ever bump heads or anything equally traumatic, though we were a little bit dizzy by the time we got to the bottom. 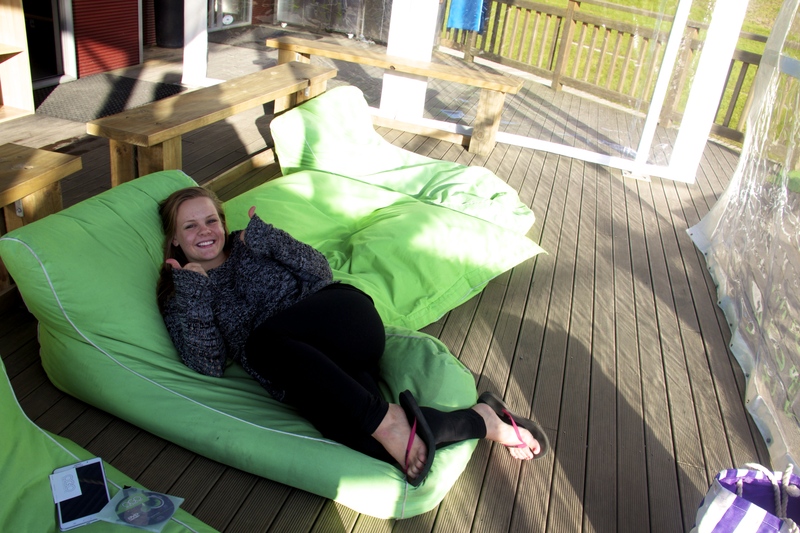 Cozying up on the beanbags post-Zorb. We snapped a few more photos at the end of our ride before headed back into the hot tubs to warm up one last time, then went to get changed while our photos and videos were being loaded onto the computer. When we were finally warm and dry, we came back out to watch the video and to look at the photos, then decided we only wanted to buy the video pack. We caught the bus back into town not too long after, still giddy from how much fun our little outing had been. Price: NZ$80 for two rides (Sidewinder and Straight), NZ$65 for Sidewinder only, NZ$45 for Straight only, NZ$99 for three rides. Photo/video is NZ$30. Value for Money: Average. Its a must-do at least once, but the price is still pretty high for the activity/how long it lasts. Suitable for: Everyone! This would be super fun to do with kids or friends, as a couple or as a family! Recommend: You definitely, absolutely have to do this if you’re in New Zealand! Maybe not so great if you’re prone to motion sickness, but I didn’t have any problem with it when I went. Sure thing! Just as long as my name stays on it (Natalie Steinberg) and a link to my blog/the source post. Thanks so much for asking!